Embark on a Niagara Culinary Experience in the upcoming New Year and get a taste of the very best food and wine that Niagara Falls has to offer. The Fallsview dining room at Windows by Jamie Kennedy. 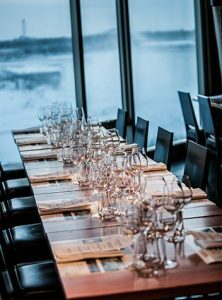 On January 19th, 2018 Windows by Jamie Kennedy Fresh Grill & Wine Bar will be hosting An Icewine Dinner with Jamie Kennedy in the restaurant`s beautiful Fallsview dining room. The event will showcase the best of Niagara`s world-famous “liquid gold“ with delicious seasonal dishes and wine pairings from Jackson-Triggs Winery. It will also feature a mix and mingle with Chefs Jamie Kennedy and Jay Jackson, standing cocktail reception with canapés and pairings, and a five course dinner with wine pairings. Niagara Icewine is a cherished Canadian product and this January you can sip and savour the very best of it at this one-of-a-kind culinary event. Embark on a culinary tour through Italy`s Tuscan region at A Culinary Tour of Tuscany with Massimo Capra on March 23rd, 2018 in the Rainbow Room`s stunning Fallsview dining room. Tuscany is a place of picturesque vineyards, magnificent art and architecture, and simplistic yet flavourful cuisine. This exclusive culinary event will capture the spirit of one of Italy`s most beloved regions and will feature a mix and mingle with Chefs Massimo Capra and John Casciato, a standing cocktail reception with canapés and prosecco, and a five course dinner with wine pairings from Antinori Winery. The final culinary event in this year`s Niagara Culinary Experiences Series is A Culinary Tour of Veneto with Massimo Capra on May 11th, 2018. Veneto has given the world amazing dishes like risotto and tiramisu and world-renowned wines like merlot and prosecco. This dinner event will take place in the Rainbow Room`s Fallsview dining room and feature a five course dinner menu inspired by the culinary and wine-making traditions of this famous Italian region. Book your tickets today and prepare to be transported from Niagara Falls to the magical streets of Venice, Verona, and the like.